The first of October was a special day - the Dula picnic. (A dula is a childbirth assistant, often an apprentice to a midwife.) One of Rose's dulas invited us to a picnic in Golden Gate Park so we could meet the other parents (clients) and their children. We were very excited to go; we hadn't seen some of these folks in a few months, others we hadn't seen since childbirth classes eighteen months ago or so. Isaac was in a wonderful mood that morning, as we dressed him in layers to cope with the fog (now) and sun (later). 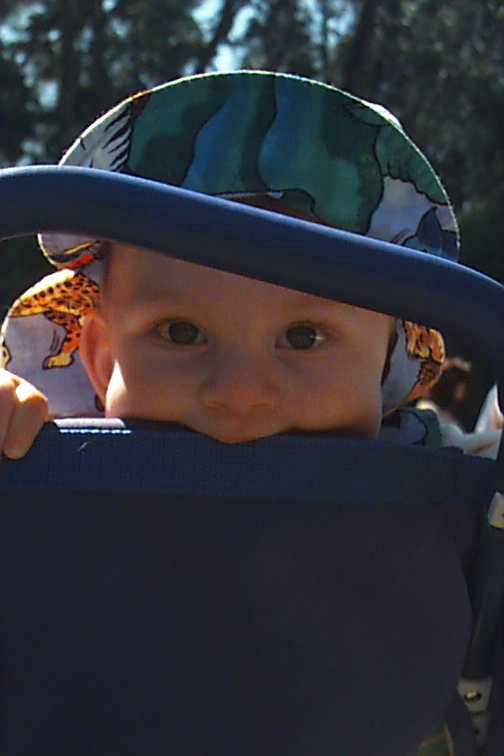 Isaac loved being around others his age. (More often than not he's among the youngest at the playgroups we've visited.) 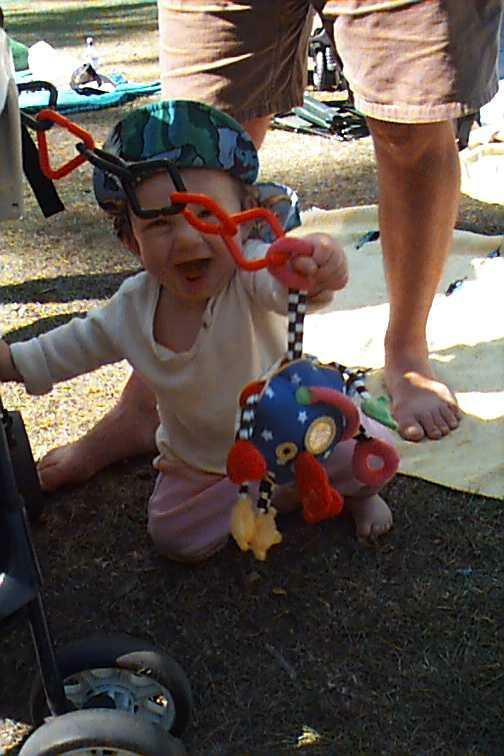 There was lots of crawling on blankets and grass (pulling out tufts of grass just to provoke the parents), climbing, standing, toppling, exploring of the other kids toys, getting fingers (and occasionally toes) into the parents food plates, screeching, crying, and laughing. A first for our boy was climbing into a stroller. Isaac found a stroller, the ones with the toys hanging about, and proceeded to climb through the foot area, into the seat, make a stable three point upright stance, and then chew on the top edge of the backrest (all the while looking pretty pleased with himself. 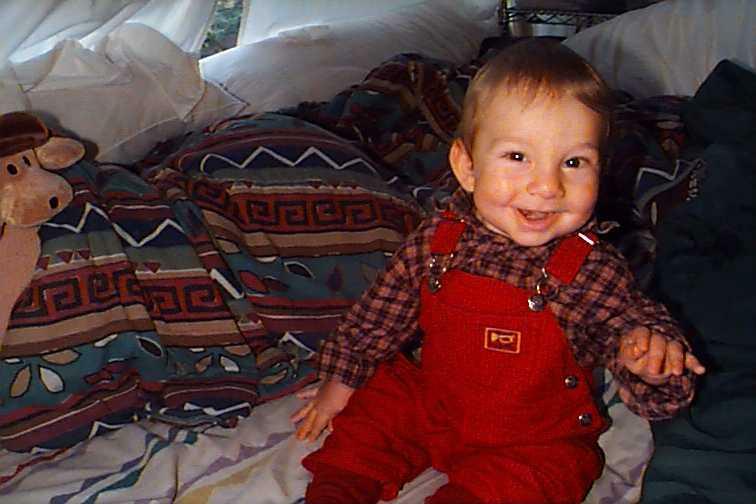 You might notice that Isaac's outfit changed from the long sleeve plaid shirt and red cordoroy overalls (protection against chill and fog) to a FlapHappy sun hat, long sleeve organic tee shirt and purple leggings (to survive heat and sun). Putting things in his mouth is Isaac's favorite form of toy exploration. We read that it's the developmentally appropriate thing to do. But it's downright funny when he finds a toy with a nose, or something that looks like a nose. 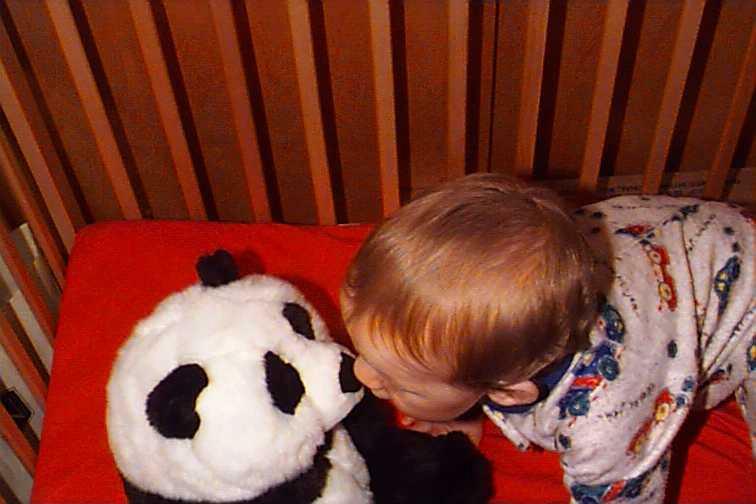 At left Isaac is greeting his panda after a long in the park, a favorite activity. Any way, the game continues. At right you see Isaac greeting a toy truck that just happens to have a hood that lights up (and must somehow seem to Isaac to be nose-like). As an added bonus, it lights up. Mmmmm. 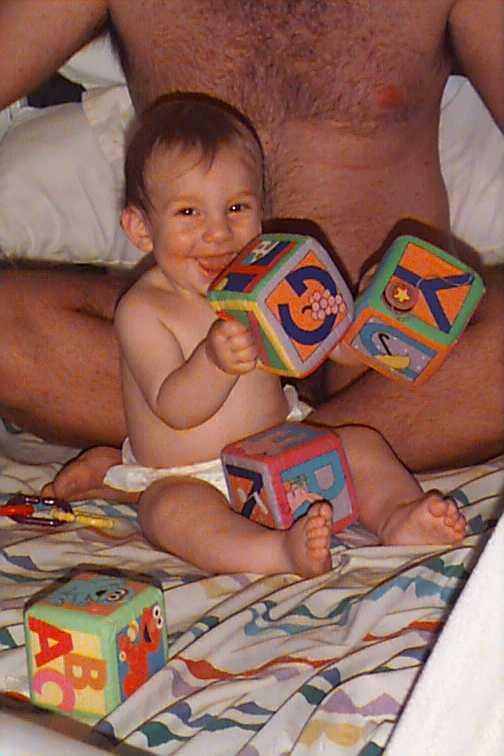 Speaking of developmentally appropriate behavior, here's Isaac grasping two blocks and banging them together. And look at the smile on that face. We'd been playing the game of "cover Isaac's ears with the soft blocks and watch him squeal with delight at the muffled sounds". Then he grabbed the blocks as Rose snapped the picture. It's a pleasure going to play groups with Isaac. He loves things like strings of beads they keep in a wading pool, pulling himself up on things, and best of all, checking out the other kids.